Dental implants are an excellent option for tooth replacement. In addition to restoring function and esthetics, they also have the practical benefit of maintaining bone in the area of the lost tooth, preserving facial structure and appearance. Implants are also multi-functional; they can be used to support single teeth or longer span bridges, as well as act like anchors to help retain removable dentures and partials. A three-part system, dental implants begin with the titanium fixture which replaces the tooth root and closely resembles a screw. 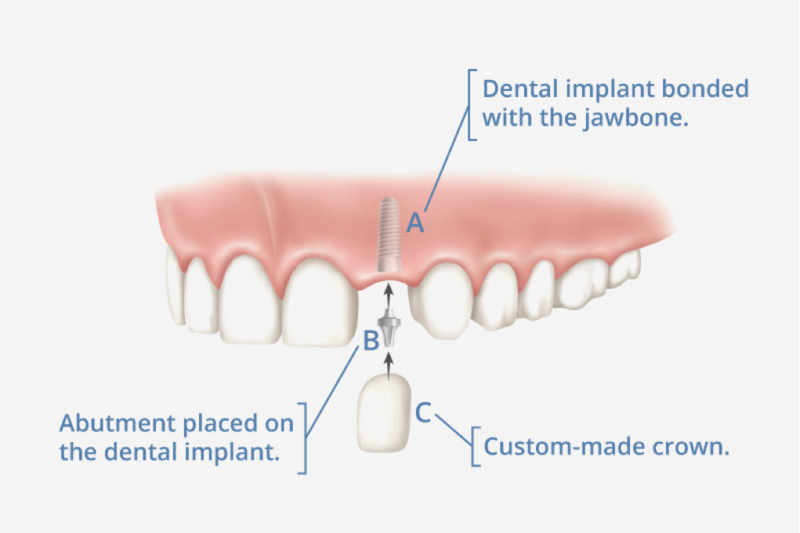 The threads of the screw hold the implant in place immediately following placement, however in time, bone grows to the titanium, fixing it permanently in place. After this integration phase is complete, usually 3-4 months, the implant fixture is ready for restoration. At this time an abutment post is screwed down into the implant and a custom crown is fitted on top. The limiting factor for implant placement and site selection is the quantity and quality of bone present in the site of the missing tooth or teeth. For this reason, we often recommend bone grafting (socket preservation) following tooth extraction to ensure a predictable and consistent outcome for the planned implant. If a site is found to be deficient and unable to support the anticipated implant, additional grafting is often possible, and advanced 3D imaging is often required for proper treatment planning. Using the latest cone beam technology, we can plan ideal implant placement together, evaluating the site and placing the implant virtually using advanced software.